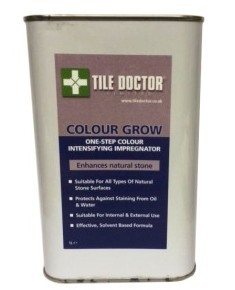 Tile Doctor Colour Grow, is a solvent based colour intensifying sealer that provides durable surface protection as well as allowing the surface to breath and enhance colour. Use on unpolished surfaces including Basalt, Cement Pavers, Encaustic Cement, Flagstone, Grout, Granite, Limestone, Masonary, Porcelain, Quarry Tile, Sandstone, Slate (Riven and Semi Riven), Terracotta, Terrazzo, Travertine and Victorian Tile. Colour Grow is suitable for both internal and external applications and recommended for areas where no damp proof course is evident. For new installations sealer can be applied as soon as 48 hours after grouting. Apply first coat using a paint pad applicator and leave to dry for 10 to 15 minutes. Polish off excess using a dry cloth. Repeat as required waiting 30 to 40 minutes between coats. Use a water test to determine if further coats are needed. One Litre will cover approximately 15m² to 20m² (150 to 210 sq. ft.) depending on porosity, type of surface, temperature, humidity, and method of application. Two coats of sealer should suffice on most floors tiles including denser materials such as Flamed Granite and Smooth Sandstones, a further coat may be required on rougher uneven surfaces and porous stones such as Slate, Flagstone, and Limestone. Clay type tiles will require more coats depending on porosity. Available in 1 litre tins at £30.00 each and 5 litre tins at £125.00 each, Postage and Packing £5.50 for a one litre tin, £10.00 for two or more litres (All prices are shown inclusive of VAT).